Anunnaki (also transcribed as: Anunnaku, Ananaki) are a group of Sumerian and Akkadian deities related to, and in some cases overlapping with, the Annuna (the 'Fifty Great Gods') and the Igigi (minor gods). The Annunaki appear in the Babylonian creation myth, Enuma Elish. In the late version magnifying Marduk, after the creation of mankind, Marduk divides the Anunnaki and assigns them to their proper stations, three hundred in heaven, three hundred on the earth. In gratitude, the Annunaki, the "Great Gods", built Esagila, the splendid: "They raised high the head of Esagila equaling Apsu. Having built a stage-tower as high as Apsu, they set up in it an abode for Marduk, Enlil, Ea." Then they built their own shrines. According to later Babylonian myth, the Anunnaki were the children of Anu and Ki, brother and sister gods, themselves the children of Anshar and Kishar (Skypivot and Earthpivot, the Celestial poles). Anshar and Kishar were the children of Lahm and Lahmu ("the muddy ones"), names given to the gatekeepers of the Abzu temple at Eridu, the site at which the creation was thought to have occurred. The head of the Anunnaki council was the Great Anu, (rather than being just a sky god, Anu in Sumerian actually means "sky"), of Uruk and the other members were his offspring. His place was taken by Enlil, (En=lord, lil=wind,air), who at some time was thought to have separated heaven and earth. This resulted in an ongoing dispute between Enlil of Nippur and his half brother Enki of Eridu regarding the legitimacy of Enlil's assumption of leadership. Enki, (En=lord, Ki=Earth), in addition to being the God of fresh water, was also God of wisdom and magic, regarded by some as an alchemist. When the Igigi went on strike and refused to continue to work maintaining the universe, on the Shappatu, Enki created humankind to assume responsibility for the tasks the Gods no longer performed. The Anunnaki were the High Council of the Gods, and Anu's companions. They were distributed through the Earth and the Underworld. The best known of them were Asaru, Asarualim, Asarualimnunna, Asaruludu, En-Ki (Ea for the Akkadians), Namru, Namtillaku and Tutu. 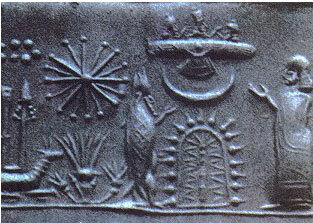 Some theorize that the Annunaki were ancient astronauts. Theorists such as Zecharia Sitchin, Laurence Gardner, and David Icke claim that the Anunnaki were in fact extra-terrestrials who came to Earth and identified the Nephilim as Annunaki. They propose various readings of the word, two of which are "anu-na-ki" and "an-unnak-ki", that translate to possibly, "those who came down", "those who descended", "those who were cast down," or "those who came from heaven to Earth." This suggests possible reasoning for the creational myth/concept of Adam and Eve and their ancestors and relations being created by genetic engineering; mixing the DNA of Anunnaki with that of Homo erectus, the reigning progenitor of man at the time. Fundamentally, this may have been due to the Anunnaki's need for laborers to work the mines in search of gold and other Precious Metals. This suggests a deeper look into the study of alchemy and ORME. Another element of this view is the suggestion that much of human wisdom or religion was given to man by extraterrestrial visitors in ancient times. This possibility has been considered by some scientists, but the lack of hard evidence and the nature of the concept makes it unpopular among the scientific community.